The empty promise of "freedom" and "simplicity"
I here offer my deepest apologies and sincerest regrets to my fellow citizens for failing to properly shoulder the burden of maintaining our faltering economy. I offer no excuses other than my unwillingness to manage the paperwork. This is about those endless offers from credit card companies that fill our mailboxes and keep the post office from going completely broke. In the 12 weeks since June 5, I received 24 of those suckers from outfits that promised in large print to guarantee freedom and simplicity in my life, plus another six mailings containing "convenience checks" for my existing credit card accounts. I just spent 90 minutes tearing all of them into tiny pieces that fill a brown paper grocery sack. However, with Michele and her fellow travelers running their mouths so much lately about all of our disappearing freedoms, I feel guilty, and really should do something with these offers besides shred them. In addition to gaining copious amounts of new credit that adds consumption capacity to the economy, I could transfer outstanding balances on existing cards for a low-percentage fee, pay no interest on transferred balances for generous lengths of time, and thereafter pay APRs ranging from 3.99% to 18.99% (the average for my 12 weeks of offers was 11.99%). 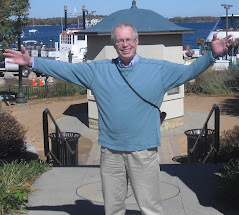 From four of the offers, I could obtain 30,000 free bonus miles each, 120,000 in total, to use on American Airlines, a company that serves Minnesota minimally and with which I have done only minor amounts of business over the years. Still, that's four times around the world. I am pretty adept with a spreadsheet, and with a bit of concentration I could probably play this shell game for years without paying out any real money on either my principal or interest. Hell, if I was half as smart as my ego would have it, I would take these offers, cash them out to the max, quit working, and use the remaining years on my passport and my life to remain free and simple outside the country. Makes sense. If Rick Perry and Texas can secede from the Union, why can't individuals separate themselves from the hard work of living and embrace the slick and easy promises of freedom and simplicity? These proferred possibilities spell "freedom" with a capital "F" and "simplicity" with a capital "S." For sure! Then, as these importunings are so rich for folks like me, one can only imagine how important they must be for the credit card companies themselves and for the compensation of their shareholders and corporate leaders. 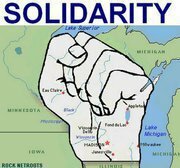 By now, all of us should know – from the mouths of Boehner, Cantor, Mitchell, and our GOP brethren in Minnesota, Wisconsin, and elsewhere – what that kind of financial good fortune means to our economy, for these people, the shareholders and corporate leaders, are our job creators. They are the very lifeblood and hope for our nation's financial salvation. They count on people like me, and you, to choose freedom. Thus, I take seriously my shirking of responsibility for insuring freedom and simplicity in this particular realm for myself and my fellows. Simply put, however, I choose to believe that life is too short for the paperwork, and even shorter for the rhetoric of the empty promises. Feeding famine: "This could be their home for a long time"
Famine has afflicted the world at various times throughout recorded history, including the successive generations of Abraham, Isaac, and Jacob in the Biblical book of Genesis. In modern day Somalia, however, there is no Joseph, ordained by God to save his people. Instead, the global community is called to act as the children of Israel and Ishmael. Displaced Somalis pour daily into the Dadaab refugee camp – the world's largest – across the border in neighboring Kenya, fleeing two years of drought – East Africa's worst in 60 years – rising food prices, and armed conflict in food producing areas. 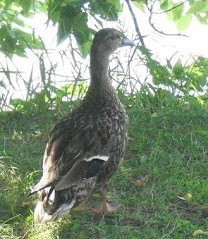 Most immediately, they flee famine with its attendant malnutrition, starvation, epidemics, and mortality. Eighty percent of those arriving at Dadaab are women and children. Their men are fighting, dead, tending herds, or giving their families all of their money to travel, on foot, across the border. In camps built to house 90,000 people, more than 400,000 now live in a space one third the size of Minneapolis. Their hope lies primarily in the Somali Diaspora. Minneapolis-St. Paul has become the de facto capital of Somalia in North America. This community of immigrants has taken up the frontline fight against famine in Somalia and other countries in the Horn of Africa. The American Refugee Committee, and its Neighbors for Nations–Uniting Communities to Help Somalia, are working with Minnesota's Somali community to raise money, buy food, and send it to the Horn of Africa. The sons of Ishmael cannot do it by themselves. They need all of the children of Israel. Every financial gift of any size is generous and will save lives and provide relief in Somalia within days. There is no time to debate who, or what, is right or wrong. Every single day I meet people in Minneapolis who are preparing for a trip to the Dadaab refugee camp or to Somalia to help with famine relief efforts. Abdi Phenomenal Farah is a student from Augsburg College who is leaving this week. Abdi is a spoken word artist, and he will have much more to say when he returns. Please watch this link of his amazing art and meet one of the upcoming leaders of our city. Minnesota Public Radio's artist-in-residence for 2011/12 shared a gemstone experience in the tour de force performance by violinist Chad Hoopes, 17. From the outset of his two-hour program in Antonello Hall at the MacPhail Center for Music, August 25, Hoopes relinquished control of neither his virtuosity nor his concentrated passion, mesmerizing listeners with accomplished readings of a range of composers, including Brahms, Bach, Prokofiev, Tchaikovsky, Ravel, and Schubert. Hoopes opened the 45-minute first half, accompanied by pianist Charles Kemper, with Brahm's Violin Sonata No. 2, Op. 100, in the only work not committed fully to memory. 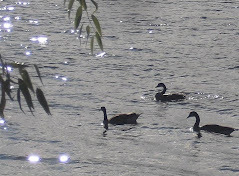 He followed with a snappy, solo rendition of J.S. Bach's Violin Sonata No. 1, BWV 1001. Post-intermission, Hoopes and Kemper breezed beautifully through Prokofiev's Five Melodies for Violin and Piano, Op. 35bis, and Tchaikovsky's Three Pieces for Violin and Piano, Op. 42. It was in Ravel's Tzigane, however, that Hoopes tore through both music and the stage with a controlled rip, at times waving his bow like a baseball bat and visibly relishing his mastery of the nuanced complexities. He said later that he had played Tzigane publicly for the first time, in Germany, only a few weeks earlier. The program reached its exquisite end with the encore performance of Franz Schubert's Ave Maria. Hoopes heard the work for the first time only in 2010, but his inspired proficiency with the 1713 Antonio Stradivari Cooper; Hakkert; ex Ceci violin – coupled with Antonello's acoustics – gave the double-stops and overtones the effect of a full string section. A first teacher, Nancy Lokken, might expect no less from a native Minnesotan who was but three years old when Santa Claus delivered his first violin. In a post-performance q-and-a, Lokken observed that Hoopes' facility of playing from the heart "was there at the beginning." During his MPR residency, Hoopes will present concerts, educational sessions, public appearances, and interviews. In March 2012, he will visit elementary, middle, and high schools throughout Minnesota to talk about the importance of music and the arts and of doing one's best in any endeavor. Hoopes is represented by IMG Artists. Following 13 years of preparation, The Cowles Center for Dance and the Performing Arts is primping for its close-up when the doors are thrown open for its opening weekend festivities, Sept. 9-11. A sold-out, black-tie gala on Friday, Sept. 9, will feature a dinner, performances, and reception. Tickets are available for Saturday's grand opening performances and reception for $150; phone 612.206.3621. The Cowles will provide 200 complimentary tickets for Saturday's festivities to local dancers and choreographers. Performers on Friday and Saturday will include Savion Glover, Clifton Brown (Alvin Ailey American Dance Theater), James Sewell Ballet, Zenon Dance Company, Larry Yazzie (Native Pride Dancers), Minnesota Dance Theatre, Wendy Whelan (New York City Ballet), Jonah Bokaer (formerly with Merce Cunningham Dance Company), and The Singers (Minnesota choral artists). A free, community open house from 11am to 5pm on Sunday, Sept. 11, will feature workshops and performances. The Cowles Center is a three-building complex located on Hennepin Avenue, between 5th & 6th streets, in downtown Minneapolis: the refurbished, 505-seat Goodale Theater built in 1910; the eight-story Hennepin Center for the Arts built as a Masonic Temple in 1888; and the new Great Hall and Education Center. 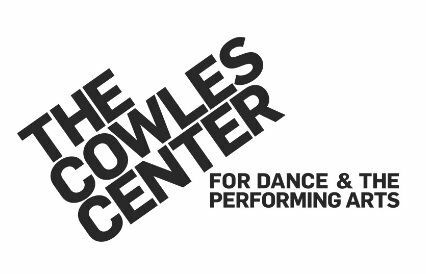 As part of its full, 2011/12 season of dance and music presentations, The Cowles will host The Minnesota SAGE Awards for Dance, Tuesday, Oct. 11. The awards will recognize achievement in six categories during the past year. Tickets for the SAGE Awards are $15. Prices for events in 2011/12 will range from $10 to $36. All tickets will carry an additional $4 facilities fee – $2 for the theater's maintenance and $2 for the ticketing system. A discount of 20% is available for purchases of four or more tickets. The Cowles box office number is 612.206.3600. Leading up to the Cowles opening, Minneapolis will host the 24th Midwest Arts Conference, Sept. 7-10, under the aegis of Arts Midwest and the Mid-America Arts Alliance. The lineup of activities will include curated and independent showcase performances that will give Minnesota artists multiple opportunities to shine. More than 4,000 artists, managers, agents, and presenting venues will be represented during the four days. On-site and single-day registrations are available. Ananya Dance Theatre will present the world premiere of Tushaanal: Fires of Dry Grass, September 8-11 at the Southern Theater in Minneapolis. "Tushaanal" – Bengali for "fires of dry grass" – revolves around stories of gold, an element mined and harnessed as capital, and a symbol of desire, beauty, and artistry. The full-length work is the second in a four-part, anti-violence series exploring how women in global communities of color experience and resist violence. Tickets are $22 ($16 students). Thu, 7:30pm; Fri, 8pm; Sat, 2pm, 8pm; Sun, 7pm. Artistic Director Ananya Chatterjea received a Guggenheim Fellowship for Choreography earlier this year from the John Simon Guggenheim Memorial Foundation. 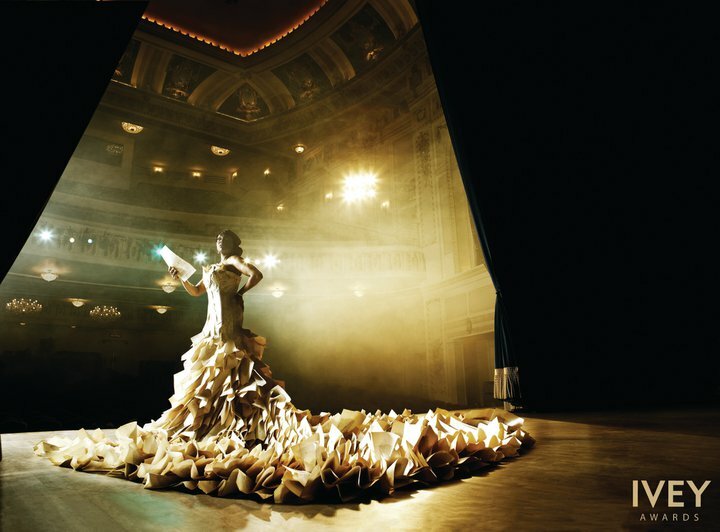 The 2011 Ivey Awards, established to celebrate Twin Cities professional theater, will be held at the Historic State Theatre in Minneapolis, Monday, Sept. 19, at 7:30pm. Actors Seth and Charles Numrich will host the evening of entertainment that will feature an opening number honoring theater costumers; singing by Ryan McCartan, a graduate of Minnetonka High School and recipient of the U.S. Presidential Scholar in the Arts award; the 7-Shot Symphony by Live Action Set; and excerpts from The Rocky Horror Show (Cardinal Theatricals), The Buddy Holly Story (History Theatre), Little Shop of Horrors (Mu Performing Arts), and Ragtime (Park Square Theatre). Tickets for the performances and pre/post parties are available at IveyAwards.com. Kathleen Spehar has been appointed Director of The O’Shaughnessy at St. Catherine University in St. Paul. Spehar has served previously as managing director of the History Theatre and of Mu Performing Arts, both in St. Paul. She holds a bachelor’s degree in music from Western Michigan University and a master’s of liberal studies from the University of Minnesota. 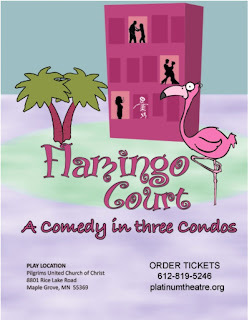 The Platinum Theatre Company will present its inaugural play, "Flamingo Court," in nine performances, Sept. 7-23. The production features three short plays, two funny and one serious, set in condos in a senior living complex in South Florida. Themes address the uncertainties of dating past age 55, loneliness, coping with aging parents, and new interests. Platinum, founded in 2010, aspires to be "Minnesota's Senior Theater." All performances will take place at Pilgrims United Church of Christ, 8801 Rice Lake Road, Maple Grove MN, on Sept. 7, 8, 13, 14, 15, 20, and 22 at 1pm, and Sept. 9 and 23 at 7pm. Tickets: $18; call 612.819.5246. Judith Brin Ingber, a Twin Cities-based choreographer, dancer, and dance scholar, has edited Seeing Israeli and Jewish Dance. 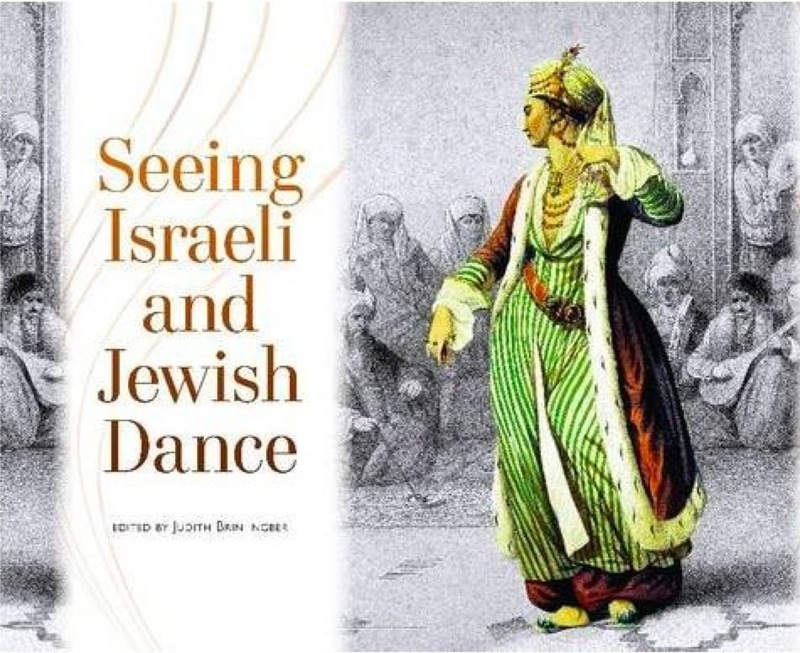 The collection of essays and photographs, published by Wayne State University Press, explores the evolution of Jewish dance through two thousand years of Diaspora. Brin Ingber will discuss the book, show slides, and sign at Birchbark Books, 2115 East 21st Street, Minneapolis, Thursday, Sept. 15, 7-9pm. A pre-supper will happen beginning at 6pm at the Kenwood Cafe, adjacent to the bookstore. "A dance to Jewish Life," Mordecai Specktor's profile of Brin Ingber and the book's creation, written for the American Jewish World, is available here. The 24th Midwest Arts Conference will descend on downtown Minneapolis from Wednesday, Sept. 7, through Saturday, Sept. 10. Attendees will include 1,000 performing artists, their managers, and agents (representing 4,000 artists and ensembles), along with performing arts presenters, venues, and arts administrators from throughout the United States and beyond. 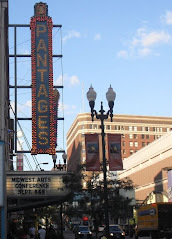 The Conference serves as convenor each September for the 15 states represented by Arts Midwest and the Mid-America Arts Alliance – an area stretching from the Dakotas to Michigan, Nebraska to Ohio, and Minnesota to Texas. In addition to networking and professional development sessions, the Midwest Arts Conference provides a forum for live performances and a Marketplace exhibit hall. 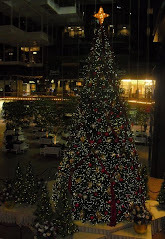 The 2011 gathering, centered at the Hilton Hotel, 1001 Marquette Avenue, is the first hosted by Minneapolis since 1992; St. Paul hosted the 2001 and 2009 conferences. The Délégation du Québec from Chicago will sponsor Wednesday's opening reception at the Nicollet Island Pavilion, 6-8pm. IMG Artists will sponsor Saturday's closing party at the Dakota Jazz Club, 5-6:30pm. This year's Marketplace exhibit hall will be staged at the Minneapolis Convention Center. Many Minnesota performing ensembles have paid for a booth presence: Ananya Dance Theatre, 701A; ARENA Dances, 121A; James Sewell Ballet, 901 and 929; Katha Dance Theatre, 128; Minneapolis Guitar Quartet, 839; Minnesota Sinfonia, 800B; Ragamala Dance, 901; Rose Ensemble, 106; Shapiro and Smith Dance, 921; Sossy Mechanics, 109; Stuart Pimsler Dance and Theater, 339A; Theater of Fools, 906; and TU Dance, 739. The Conference will present 18 artists and ensembles in curated, showcase performances at the Pantages Theatre, 710 Hennepin Avenue, on Thursday and Friday evenings, including Minnesota's Stuart Pimsler Dance and Theater at 7:35pm on Thursday. Numerous showcase performances will be produced independently throughout downtown on Wednesday, Thursday, and Friday evenings, with a majority staged in the Hilton Hotel's ballrooms. All of these performances are free, and nearly all of them will welcome respectful audience members from the local community if space allows. All performances begin promptly at stated start times. 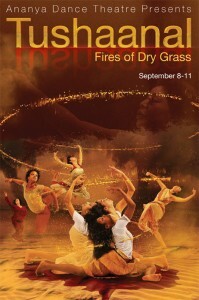 Wednesday, Sept. 7 – 8:30pm: Ananya Dance Theater, full-length presentation of "Tushaanal: Fires of Dry Grass." ADT shuttle will pick up conferees at Nicollet Island Pavilion at 8pm with return to Hilton Hotel at 10pm. Venue: Southern Theater, 1420 Washington Avenue South. Thursday-Friday, Sept. 8-9 – 9:30pm: Shapiro and Smith Dance; 9:45pm: Ragamala Dance; 10pm: Stuart Pimsler Dance and Theater; 10:15pm: James Sewell Ballet; 10:30pm: Zenon Dance Company; 10:45pm: TU Dance; 11pm: Sossy Mechanics. Venue: James Sewell Ballet's Studio 2A, Hennepin Center for the Arts, 528 Hennepin Avenue. Thursday-Friday, Sept. 8-9 – 9:30pm, 10:15pm, 11pm: ARENA Dances. 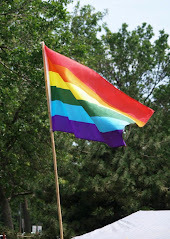 Venue: Studio 5B, Hennepin Center for the Arts, 528 Hennepin Avenue. Friday, Sept. 9 – 9:30pm: Rose Ensemble. 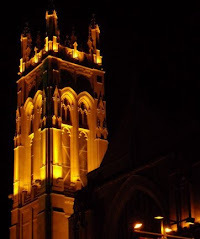 Venue: Wesley United Methodist Church, 101 East Grant Street. Six Wisconsin senate districts will hold recall elections on Tuesday, Aug. 9. Residents who care about the future of that state and the nation must turn out to vote. The recalls have been prompted by the legislative agenda rammed through the GOP-controlled Assembly and Senate by GOP Gov. Scott Walker. The extremist and un-American agenda seeks to alter the state's political dynamic under the guise of financial stewardship. Republicans control the senate by a margin of 19-14; Democrats must pick up a net of three seats in the recalls in order to gain majority (17-16) control of that chamber and restore checks and balance to Wisconsin's political process. The electoral stakes are high for both sides, as reported by Politico and articulated by Judson Phillips, CEO of Tea Party Nation. Speaking at an Aug. 6 rally in Thiensville, Wisconsin – sponsored by the Tea Party Express and promoted by the Republican Party of Milwaukee County – Phillips said "I detest and despise everything the left stands for. How anybody can endorse an ideology that has killed a billion people in the last century is beyond me." A day earlier, according to Politico, Phillips "likened protestors of Gov. Scott Walker to Nazi storm troopers." Also according to Politico, another speaker at Saturday's rally, Vince Schmuki, said "Tuesday is going to be the beginning of our takeover. And we're going to follow it up the following week, and then we're going to polish off the enemy in November 2012." District 32 - incumbent Dan Kapanke, R-LaCrosse, challenged by Rep. Jennifer Shilling, D-LaCrosse. 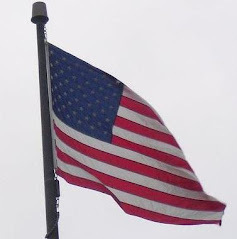 Two Democratic senators will face recall votes on Aug. 16: District 12 incumbent Jim Holperin, D-Conover, faces challenger Kim Simac, R-Eagle River, and District 22 incumbent Robert Wirch, D-Pleasant Prairie, faces challenger Jonathan Steitz, R-Pleasant Prairie. District 30 incumbent Dave Hansen, D-Green Bay, defeated his Republican challenger, Dave VanderLeest, with 66% of the vote on July 19. The Milwaukee Journal Sentinel has tagged the recall efforts as "ugly, unnecessary, and expensive," and has declined to endorse any candidates on the principle that recalls should not be used to dispute policy differences. Most other Wisconsin newspapers are playing it straight-down-the-middle, opting to encourage readers to vote without making endorsements. One exception: The Capital Times in Madison endorsed Democratic challenger Clark over Republican incumbent Olsen in District 14.